Not many years ago, going away on holiday to a foreign destination meant leaving work and home behind. Relaxing in the Sun, not a care in the world. Now, and some would say, unfortunately we can take a mobile phone on holiday and speak to everyone back home at the touch of a button. You can even keep in touch with what is going on at work! Some workaholics find themselves sitting by a pool taking and making calls all day. Business mobiles are one thing – the company will pick up the bill in most cases. However private users need to be aware that mobile phone rates for a UK mobile used internationally can be excessive because of roaming charges. The ability to have a roaming service provides the opportunity to make and take calls and text from anywhere in the world with someone back home but mobile phone networks charge a premium for this. A particularly horrific example is for a family going to Australia for two weeks. If you call home, or they call you and you talk for about 6 hours over the course of the holiday, your bill would be almost £700. It can cost £1 a minute to receive a call, or an answer phone message, and you have to pay equally high rates to then listen to the message. It is also possible to run up a huge bill if your phone is set up to try to keep connecting to browse the Internet. A friend of mine recently visited her parents in the USA for a week and ran up a bill of over £400. And she neither made nor received a single call on that mobile. While receiving texts abroad is free; the price of sending a text is high – around 50p for each text, even if you just put ‘OK’. Teenagers are particularly prone to getting into backwards and forwards messaging with their friends with very short messages – but the bill can soon mount up. Receiving calls, as already highlighted, can cost £1 per minute and it is just as expensive to make a call. But don’t be fooled into thinking it would be better to use the hotel phone – these are often extremely expensive and you won’t be any better off. The most effective method is to leave your mobile switched off at home but most of us need to keep in touch now that mobiles offer that opportunity. 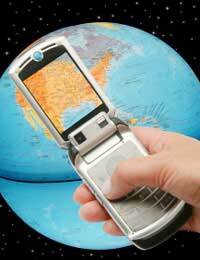 It is possible to buy a Global Sim card to put into your phone that can be used anywhere in the world, or a country specific sim card. At the moment, if you are going to Australia, you can buy a pay-as-you-go sim card that is specifically for use in Australia for £30. This will allow you to receive all your calls free – so if you get people at home to phone you, your total bill will be £30, so you could save hundreds. A global sim is currently available for £20 and you get nearly £7 credit. It covers 130 countries and allows free incoming calls in more than 60. Call costs start at 30p per minute and texts are 42p but Internet connection charges are still steep at £3.10 per megabyte of data transferred. Whatever method you choose, it is wise to disable the browser to stop it connecting unless you want it to. Your own network provider may also offer cheaper roaming options, particularly if you have a contract with them rather than a pay-as-you-go phone. Deals are changing every week and every month – the most sensible thing to do is check on what is your cheapest option about 3 weeks before your trip. Make a plan of how you will use the phone, how to get the calls and texts you want to make as cheaply as possible – and then stick to it.